Looking for fasteners, trick aircraft hardware and plumbing? Visit our new division Bon Aero for a full line catalog or order a copy from us. 108 pages of technical information, full line listing and prices. Over $150,000 in inventory. Memorabilia available soon. We are curently working on putting some Lotus and EnFord collector memorabilia on the website for those collectors out there to purchase. Lotus Memorabilia Stumbled onto this stuff during an obsolete files destruction process. Most of it is from our dealership days. At the time I thought I was a memorabilia collector, I'm not really. So we are offering this to the Lotus enthusiast who is. Lot 4: Late 80's/early 90's Lotus Brochures. Contains: Heavy card color folder containing 8 loose leaf color pages featuring '89 Esprit S3 Turbo, Turbo SE & Eclat with color charts & English price list. Another heavy card stock file containing 3 page folders on the '87 Esprit range and Eclat. File itself unfolds with several pictures and text espousing Group Lotus technical expertise. 2 V8 Esprit brochures, full color on glossy hard stock. 6 page dealer folder on the Elise introduction. Lotus Engineering's "Advanced Transport Technology" folder containing 14 hard stock leaves espousing Lotus' engineering prowess. Not a dealer brochure but a genuine industrial solicitation package offering their expertise to other car manufacturers. Titles include: Lotus Engineering, Power train Engineering, Aerodynamics NVH (acronym for noise, vibration & harshness), Electronics & Instrumentation, Styling Design, Vehicle Testing and Development, Vehicle Engineering, Active Control Tech, Composite Materials Tech, CAD & CAE Services, Project Management, Lotus Engineering Resources and Millbrook Proving Ground Facilities & capabilities. Very impressive! Lot for $200 or will consider offers for individual items. 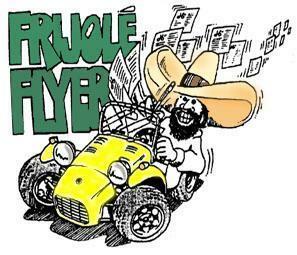 Our latest Frijole Flyer (from 2003) can now be downloaded as an Adobe Acrobat PDF file. Click here to view. Please note, this is a l.4mb file and may take a while to download via dial-up.